This week's Sunday project was to try and draw a structure whose purpose is to get some solar panels ~1.5 meters off the ground. I have ordered ten 270 Watt modules which will be arriving in spring and plan on building a structure to mount them in which can be tilted at least on a per-season basis. The main goal is to be able to have the panels vertical during winter, both to catch as much sunlight as possible and to keep snow off. Snow is also the reason for the 1.5 meter elevation. This is far from finished, and more of a learning experience really. The entire construction is 45x95 mm lumber (2" x 4"), which is way too small. A reference design that a friend of mine sent me uses 45x195 mm for long horizontal parts and 45x120 for vertical and diagonal bits. I have some lumber stashed away too that I will have to measure come spring, much of which are quite hefty pieces. 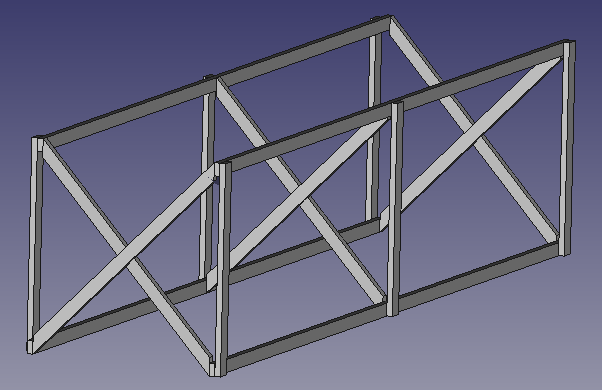 The main problem/concern I had when making this is the lack of an assembly workbench in FreeCAD 0.16. In other words being able to specify how parts go together with constraints similar to how parts are designed with constraints. This is something which is in the works for future versions, but I didn't feel like compiling my own binaries just to get that. For now this leads to some annoyance when parts have to be repositioned if dimensions are changed. 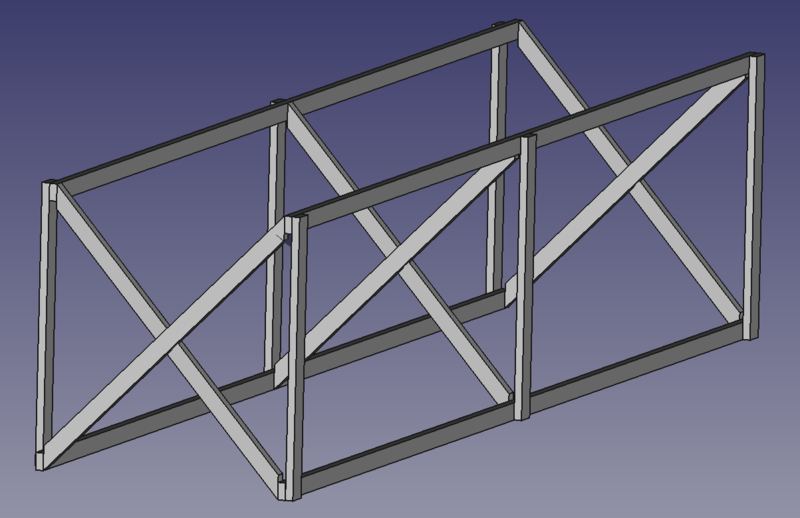 Therefore it is currently easier to draft something on paper and only use FreeCAD for veryfying that it fits together in 3D, and for sanity checking measurements.